The SFA’s Citizen Digital Team build and manage digital services which give people career information, advice and guidance (IAG). When I joined the team as User Research Manager, I inherited the existing research the team had done. This reassured me that the Agency was already putting the user at the heart of its new services. Our research was conducted through phone interviews, surveys, focus groups, interviews with careers advisers, and web analytics. 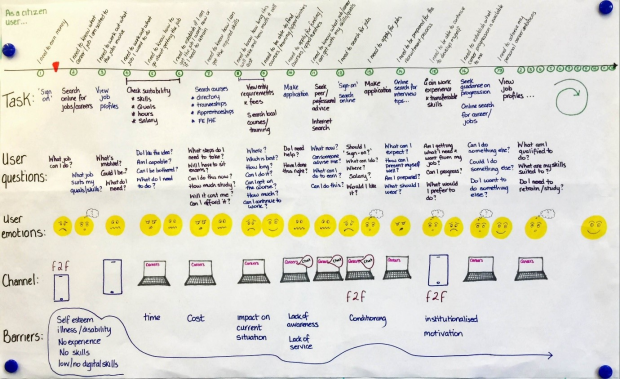 The findings allowed our team to start thinking about what a digital IAG service might look like and helped us identify which needs were most important to users. As User Researcher I continued in my quest to understand the wider needs of the service users. I interviewed over 80 people - current users of the National Careers Service, potential users of a digital careers service, and front line careers advisors. From my research I established 17 user needs, the most important of which being users’ fundamental need to have a job/career so they can earn money. The remaining user needs all contributed to this ultimate aim in some way. Once the user needs were understood, I was able to work with the team to map the potential user journeys (users’ interactions with our service over time) and identify places where barriers or difficulties could exist. Our research told us that while all users always have the fundamental need to make a living, other types of need occur at different points in different users’ lives, or occur several times in one user’s life. For example, for some users the need to find out about training opportunities occurs when they leave school at 16, but for others it may occur 20 years later when they want to change career. Many government digital services have a linear user journey with a beginning, a set of steps carried out in a particular order, and an end. By contrast, most of our users have a cyclical journey with our digital careers service. They dip in and out of the service, to meet different needs, over a long period of time. Early testing showed us that the screen displayed above was problematic for users and the concept misunderstood, so we made changes based on users’ feedback. Many iterations have been made to improve the prototype in response to user feedback. You can view the different versions of our prototype (listed as sprints at the bottom of the page). Our research has been has been paramount in helping the Citizen Digital team develop a service that will meet users’ needs, but of course there is more to be done! 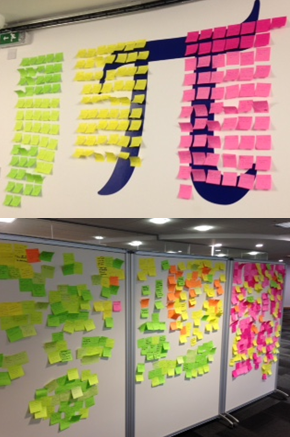 We will continue to research and test with users and perhaps even begin new projects to develop the ultimate personalised IAG careers service for citizens …so watch this space!